'Continual reference is made in parliament and elsewhere to the result of the June 2016 referendum on membership of the EU as being “the will of the people” and that the “result of the referendum has to be respected”. It is even suggested that it would be a denial of democracy not to enact the referendum result. Based on this, some of the 450 Members of Parliament who have previously voted for remaining within the EU have even voted in parliament against their deeply held conviction that the United Kingdom should be member of the EU. In this important and carefully researched article, former Liberal MP and current Leeds for Europe committee member, Michael Meadowcroft, explains how the 2016 EU referendum was fundamentally flawed. He argues that our MP's are failing in their duty if they hide behind the referendum result and so fail to exercise their judgement on this crucial issue. 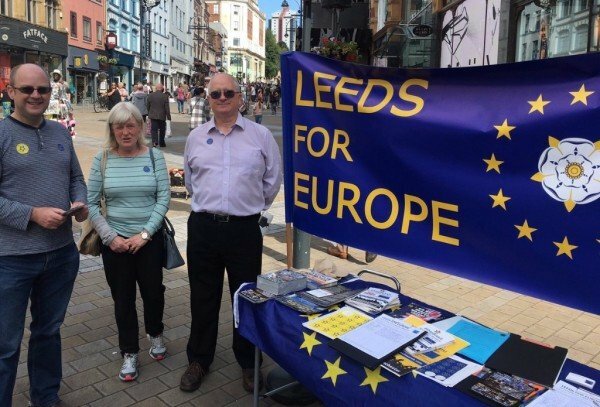 Leeds for Europe is a group which campaigns through legal democratic means for the UK to remain in the European Union. We are not affiliated to any political party and welcome anyone who shares our aims. We are affiliated to Britain for Europe and the European Movement. We have teamed up with the excellent Word Up Design, the independent business which designs apparel and accessories for passionate pro-EU people. They have created for us arange of unique and stylish Leeds for Europe branded products. 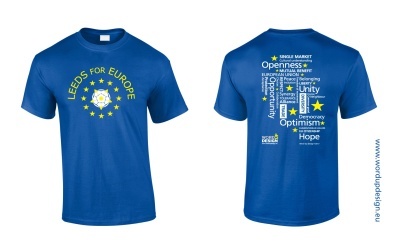 You can buy Leeds for Europe T-shirts (£14.99) in a range of styles and sizes and mugs (£9.99) directly from the Word Up Design website. Leeds for Europe was founded in 2016 following the result of the June European Union referendum. We began life as a Facebook group but since then we have grown into an active political campaigning organisation with several hundred supporters across Yorkshire and the rest of the world. We are not connected to any political parties, but we are proud to be affiliated to both Britain for Europe and the European Movement. Britain for Europe is the umbrella organisation for the various local groups like Leeds for Europe. Very much a grass roots organisation, Britain for Europe provides a forum for uniting all of the activists who, like us, are working to put a complete stop to Brexit at the earliest possible moment. Founded just after World War II, the European Movement is an independent, cross-party, non-governmental organisation. It is centred upon fostering peace and cooperation with our European neighbours and partners. Now, following the 2016 EU Referendum the European Movement has turned its attention to fighting plans to exit the EU. On the 23rd of June 37% of the British electorate voted to leave the European Union in an advisory referendum. During the campaign the Leave side repeatedly suggested that Britain could leave the EU without sacrificing the key benefits of membership. In essence, Britain could have its cake and eat it. Since the referendum the May government has made it clear that Britain will leave both the single market, the world's largest market place with over 500 million consumers, and the customs union. It is now obvious that the promises made during the election campaign will not be kept. Now that we know something about what kind of Brexit the government intends, we believe that the people should again be able to choose whether they wish to continue as members of the European Union or choose the course of hard Brexit the government has chosen for the country. Why Do We Need The EU? Europe has been plagued by war for centuries. European powers in the past sought to pursue their own self interests in a deadly game of alliances and rivalries that frequently broke out into open warfare. Since the European Economic Community (the fore-runner of the EU) was founded in 1957 there has not been a single armed conflict between member states, this represents the longest period of peace in Europe's history. The modern era has seen a huge increase in the population of Europe. Resources that were once abundant are now scarce. Fish stocks are one such example. Fish do not respect international borders. The over-fishing of grounds in one country's waters affects the fishing industry in another's. Therefore, there is a need for a body to legislate in the common interest and not the narrow interests of one state. The EU serves that function. All member states of the European Union are democratic and share the common values of freedom and justice. The European Union through its relations with countries promotes these values both in Europe and across the globe. The collective bargaining power of the European Union is enormous. It comprises the world's largest market of over 500 million wealthy consumers. The EU has developed an extensive network of trading relationships with more than 50 countries across the globe.